Review: "Need to know what your site visitors are doing today, tomorrow and next week.... Look no further than Kissmetrics!" I personally vetted and researched different analytics platforms two years ago. I realized that I had no idea if our blog content or social content was delivering top of the funnel leads and most importantly demos. After careful research and testing, I found that Kissmetrics is able to answer these questions and more! Currently, Kissmetrics is utilized by the marketing team, executive team and member success--with other departments researching the best way they can also use the data that Kissmetrics provides! Tracking leads and demos from content and social media (this works perfect and has allowed us to nimbly change content strategies and social posts to hit on topics that provide the best return. Tracking how event leads interact with our website after an event (this is something that I came up with and surprised even our Kissmetrics account rep). Track account-based marketing leads and sees if our offline efforts get them to our website. And TONS more! We can't imagine starting any campaign without Kissmetrics now--it is what essential to our marketing efforts! Track desktop and mobile sessions for a single user. Provide high-level detail on how different user-defined funnels are performing. Ease of install--seriously, most people can easily install the tracking code themselves and have this running in minutes. Installing.... yes this is also a negative. While you can install and have the program running in minutes, if you use Unbounce, the form tracking process is quite complicated! Updates... I feel like the product updates have slowed a lot lately. Thankfully, the product functionality is so amazing that it hasn't impeded the use of it. However, it is still disappointing to see less frequent software updates. Occasionally clunky UI... there are a few reports that are really easy to mess up and leave you scratching your head on why it isn't showing you any data. Kissmetric is well suited for people that feel that they are not seeing the right kind of data from Google Analytics. If you have ever looked a Google Analytics report and said "I wish I knew what the 10 people that read this case study did before, after and even a week from now on my website", then Kissmetrics is for you and will help you answer those questions. On the other hand--if you have no technical expertise or knowledge of viewing data, then Kissmetrics may prove a bit difficult for you to set up and manage. "Creative Marketing Strategist's Kissmetrics Review"
Every client we have at Curaytor has a website that is hosted on our exclusive platform. We offer a service that sets up Kissmetrics on their website in order to guide visitors from page to page in a logical fashion. The hopes are they are guided to relevant content at the right time, enhancing the customer journey and leading to higher engagement and conversion. It's a great alternative to the more expensive chat bots such as Drift and Intercom. It allows you to set up a pathway for your customers to follow. Kissmetrics Review: "Extremely helpful for web analytics but hard to maintain"
It is used by the product team for web analytics to make data-driven decisions to enhance the user's journey. It is used for all kind of engagement and behavioral analytics. It is well suited for web analytics at a small and medium business level but not for early-stage startups because of the cost factor. Review: "For detailed user activity, Kissmetrics is your tool." We set up Kissmetrics to get a better understanding of how users were using the website in order to better tailor the site to user needs/wants. The data provided is very useful if you know what to do with it and the program works well. It seems there are constantly new features, which is always a plus for any software. Overall the software is great, and very useful, but the cost can be prohibitive for a small company. The extensive data is great for really understanding your website users. Easy to see the exact flow that your users follow and can give insight on where you can improve. Extensive report data, and you can really dig down to find just about any information. The cost is really not affordable for a small business or startup, but if you can budget it, the data is invaluable. No graphical outputs-- it would be nice to have graphs for those clients that are more visual. Bit of a learning curve if you're not already familiar with data it provides and how to use it. A great tool for companies that want to really track their website users and/or are using funnels to gain customers. The data Kissmetrics provides is invaluable to a strong marketing plan to determine what is and isn't working. For small businesses and start-ups the cost can be prohibitive. But if you want extensive data on how users are interacting with your site(s) Kissmetrics will give it you. 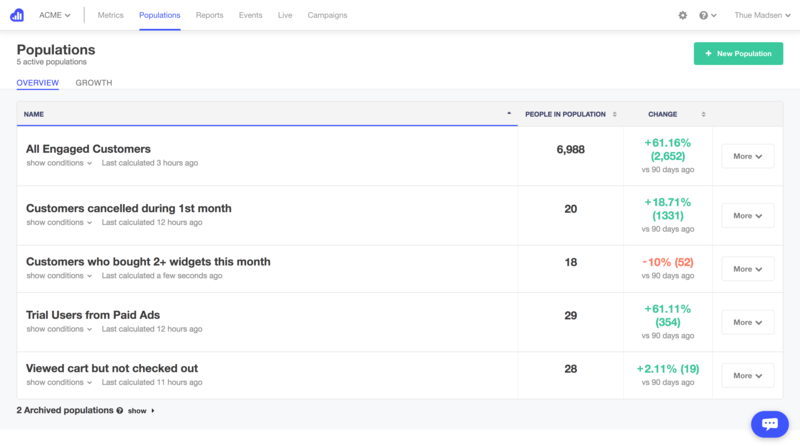 Kissmetrics Review: "Powerful, yet simple sales funnel analytics"
We have used Kissmetrics tools for several months, originally as a supplementary analytical tool to Google Analytics, then as a selfstanding toolset that overcomes several Google limitations. I have used this solution by delivering marketing and sales optimization projects, aiming at reaching higher conversion rates. Using this tool helped us to set up and analyze the customer behavior and delivered nice reports in a short time. Integration with other tools - when an "online" or "near-online" integration is required the tool does not cope. You can always export data to JSON etc. and load them into a second system, but this is not a viable solution for many business applications. UI - the user interface is not very user-friendly, it is not always very intuitive. Kissmetrics Review: "Your Data Complement to GA"
We use KM to identify leaks in the funnel and understand the flow of the visitors' behavior. We track how traffic learns about our company and our service; we also use it for calculating how many people visit a page over a period of time and the conversion rates of customers coming from different traffic sources. KM provides granularity of all information, performance can be checked in near real time. The interface is clean, intuitive, and easy to navigate. KM pulls data and refreshes itself which removes the manual work alternative platforms require. The various reports types and how to use them can be unintuitive and confusing to new users; in addition, the reports can take awhile to load and they can also be difficult to customize. It should easier than it is to modify the underlying data so that users could easily remove test traffic and robot clicks to gain more accurate information. KM lacks automatic event tracking, if you've forgotten to add an event, it doesn't pull data retroactively. Kissmetrics shows us where visitors click and move around on the website, providing us qualitative and quantitative data which we use to influence how we engage our users. When it comes to needing to generate low-level, customized reports, we find it easier to rely on other solutions the provide better functionality and more features. Kissmetrics Review: "Analytics taken to a whole new level"
We've used Kissmetrics for a few years now which was initially used as supplemental to Google Analytics. But over time it has grown rapidly in regards to functionality and features it has and we've now used it as a replacement for Google Analytics. It definitely helped increased conversion rates and increased goals across our digital marketing campaigns. First time setup is time-consuming, should be improved upon. Some experiment reporting requires the user to be very tech savvy. Kissmetrics is great to use when you need to identify the individual user's behavior and the journey taken throughout your website to identify improved paths to conversions. There is a learning curve when analyzing the reports produced within Kissmetrics but it is worth the investment. Being able to monitor social campaigns and content marketing efforts. User Review: "Kissmetrics helps keep data simple." Kissmetrics gives us essential information about key metrics along our motion rate which are critical for adoption by our users. These insights put us in a position to be proactive in identifying trends contrary to our assumptions during development/ release and also closely support the effective pursuit of our OKRs for the whole Product team. Would love to be able to drill down on the data more (once it's available). We use Kissmetrics across a wide and increasing range of data points within our organization. From simple campaign-related conversion tracking to more complex in-app actions along the critical motion path. It's a great no-nonsense management dashboard to keep a focus on things that matter and is becoming more essential to our organization daily. Review: "Engineer + Data Analyst Perspective on Kissmetrics"
Kissmetrics has been deployed to our whole company. We use it as a self-service analytics tool to calculate metrics around key events that happen within our system. Our advanced analytics are done using a data warehouse. Its an OK analytics tool to complement Google Analytics. Debugging Implementation Issues/Verifying the implementation is doing well. The interface is really cumbersome especially for basic tracking of just specific events over time by property. Because it's an event driven system there is no way to modify events in the past. For example if you are selling products and returning products there is no easy way to just look at the orders that were not returned. I wish the data export was more real time then the batch transfer to S3. 1) Do you need an event system or a data warehouse? 2) What specifically are you trying to track and report on? 4) What is the pay-back period for a tool like this? It's hard to calculate but see how many events you are sending and the types of analytics Kissmetrics can do over a data warehouse. Review: "Kissmetrics is much easier to implement than other providers and gives your control of your aggregation unlike Google Analytics"
We use Kissmetrics to track user behavior within our website, mobile apps and inside of our API. Easy to implement tracking within the API so that you don't use too much dev time on tracking users instead of developing the product itself. You can add properties to the events so that you can enrich the data you are collecting later. Lots of help within the community and tools that are available, such as statistical significance calculator. The numbers take a while to settle. Because of the sheer amount of events hitting the platform it can take a day or so for the number to be static between days. Live feature is very hard to use for testing, if you could filter out the feed by IP address that would be excellent! If there could be some kind of margin of error visibility so that you know how well to trust the exact numbers that would be great. 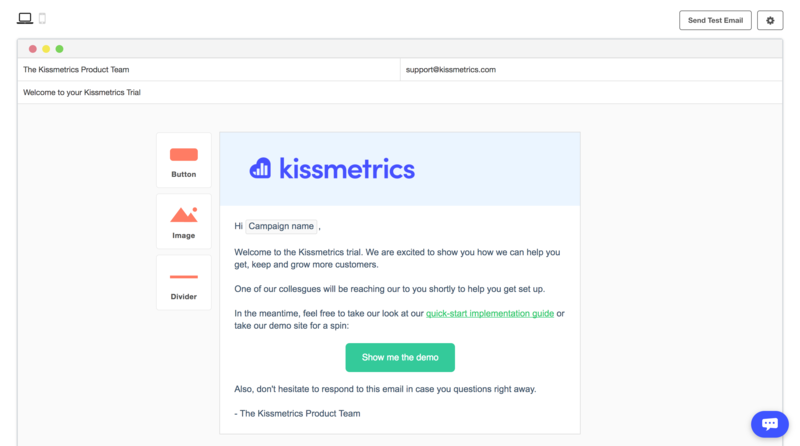 Kissmetrics Review: "An easy to use tool for tracking and data analysis"
Our organization uses Kissmetrics for business intelligence analytics and user tracking. Currently we're using it for building analytics for a multi million user base and Kissmetrics has never run short for our purposes. The BI department uses it for gathering useful data and the dev team has always felt comfortable when working against Kissmetrics. Good and concise documentation for development. Interface for different environments can be confusing sometimes. Some analytics can be hard to configure the first time. First time on the site experience can be better for newcomers. Maybe Kissmetrics is not the best tool for businesses with a very small user base, as the analytics cannot achieve the best level of relevance, but anyway, it's a great tool for anyone who wants to gather data and build insightful metrics based on it. 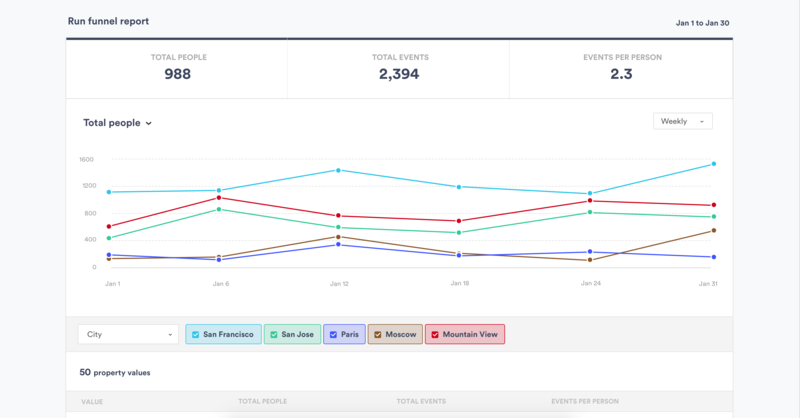 Our organization uses KissMetrics to track user events across our web application and then to create reports on usage. It is used primarily by the product owner and developers but it is also available to support and sales. It enables the organization to make data-driven decisions about actual usage on our web app. Kissmetrics seems well suited to out of the box reporting once the appropriate events are set up. User Review: "A big kiss for KISSmetrics!" KISSmetrics is used by marketing, sales and product development. When we first started using it, we got a lot of insights into how our users were using our product. Thanks to that we have a better understanding of our customers, and we were able to make some changes to important steps in the conversion funnel. It really improved (and keeps improving) our product. Besides product development, marketing can get a perfect view of where the converting users are coming from and our sales department can identify both people who have a high potential in sales, and people who got stuck or don't use the power features of our product. The more events you track and properties you send along, the more you can see how specific users use your product/service. The user based timeline gives you a perfect start point to get in touch with users, because you can see where they get stuck. Tracking your traffic sources and how they influence conversions is awesome. You can get a perfect view of how much a traffic source contributes to revenue. Funnel reports give you more insights into micro and macro conversion steps and give you actionable data to work with. If you have a mobile or web application you MUST use this software to see how your users are using your product. I don't have any experience with e-commerce sites, but I can imagine it must be awesome to see how much revenue a newsletter generates, and how your different segments are performing. User Review: "KISSMetrics is the Bomb Diggity." KISSmetrics is a person-based analytics product that helps you identify, understand, and improve the metrics that drive your online business. It helps you keep track of the visitors on your site, what they do, and allows you to hit them up with the right offers at the right time. Love it. Figuring out which campaigns brought which visitors to the site. Better documentation and tutorials, perhaps. I recommend KISSmetrics all of the time. Review: "KissMetrics is one of the most advanced analytics tools in the market today and for years to come!" KISSmetrics gave me better segmented data and the ability to run better cohort analysis. You will get better data from your users than any other tracking platform out there. The data visualization tools are amazing! You will make better data decisions with KissMetrics! The price can be a little high for a bootstrapping startup but worth it. You're going to have to be more tech savvy to setup more advance experiments. You might have more data than you need. I could write a blog post about how awesome KissMetrics is and also add them to my resources pages. Kissmetrics Review: "Kiss Metrics - user level analysis"
We decided to buy KISSmetrics to augment the data we were collecting through Google Analytics. Since the majority of the transactions on our site were generated from repeat buyers and there's a huge LTV skew toward a small percentage of buyers, we really wanted granular data regarding user behavior. The tool was pretty easy to set-up, but you need to pay attention to the way that visitors are counted and how attribution works with dimensions. If you're used to GA, KM is more like universal analytics, which represents more of an event: attribute model. They've done a lot to speed up reports over the past year and being able to see the paths of actual people across time as they traverse events and properties is very interesting if you're managing UX or marketing. It's a good product if you have a use case that ties into analyzing individual user behavior. If you have a site which is primarily lead generated or very limited in scope, or where behavior is very homogeneous, there's no point. Kissmetrics Review: "Great product! Very worth it!" We love the power of KissMetrics. With our SAAS service, it's imperative we can quickly capture the metrics we need to know what users are doing and where we're losing people. Kiss Metrics offers all of those needs and a becomes a daily spot for you to dive into user data and marketing metrics. There can be a small learning curve for more advanced features, but once you get the basics down you can really gain valuable insights. Definitely worth the monthly fee to gain these insights. Within funnel reports, the use and display of properties from events is very weird. It took us a while to figure out what the property stats were actually saying. At the price point this is not a tool for someone that is just getting their business started and is spending less than $500 a month in marketing or less than a few hundred people to your site per month. It's very robust and is an investment in time to get set up and going. User Review: "New to KISSmetrics and loving it." I am new to KISSmetrics, but I love everything about the software. Currently, I am using KISSmetrics to track the sales on a popular Woo Commerce site. From what I've discovered, there is absolutely no equivalent to the insights offered by KISSmetrics. We are able to use KISSmetrics to do a better job at tracking the profitability on our marketing channels. I am still getting to know the capabilities of what KISS can really do but we've already found ways to improve our spend, and the tool easily pays for itself. My experience so far as made me a huge fan of KISS and I am working on incorporating the tool into the site of a music label, and a B2B lead generation site. I can't wait to see the results there as well. KISSmetrics works great when you have either a high-traffic website, or a high-profit product. KISSmetrics is perfectly suited for SaaS and E-Commerce websites. I plan on testing it out on a lead generation site and I expect a positive experience there as well (but I've not personally experimented with that type of site yet). This product provides excellent information to make informed choices around our data. It has given us insight into our consumers as to how and when they are using our products. It's been a lifesaver and their blog and helpful resources have been what we use to ensure we're on the right path with the product. The price per month is expensive for smaller businesses, but is worth it in order to grow and understand your customers. I think this provides more stats than any other service. To be successful I suggest reading their blog. That is always full of excellent content for our industry whether you use the software or not. Review: "KISSmetrics helps you get actionable metrics for your business." KISSmetrics is a great tool for analytics, especially if you're looking to see in-depth insight on visitor journey instead of just visitor figures and pageviews. KISSmetrics was one of the first analytics platforms to really focus their attention on individual visitors rather than page views. I use it on a daily basis, and it informs nearly everything I do in terms of outreach to users. Have they used my company's product? How much? When? Where have they traveled on my website? Not much, though the price can be a bit too high for some businesses. Setting up configuration and on boarding may be challenging at first. It is perfect for SaaS and eCommerce, I don't have much experience with other industries. KISSmetrics helps us understand who exactly is finding us via our online advertisements and creating accounts. Specifically, we're able to match up a specific account to an ad click-through and determine which customers are clicking which ads. We are also therefore able to tie back sales to specific ads thanks to KISSmetrics. Would be great if KISSmetrics tied in directly with our adwords account. KISSmetrics is a great tool, as it helps us define what account signup has clicked on what online ad. It is better suited for online retail which is not our business, so many of the tools that they offer are really not helpful for our business. We use KISSmetrics to track the key metrics from our SaaS products. I've found myself using Google Analytics to compare traffic and conversions between channels. KISSmetrics is being used by the marketing department to make actionable decisions regarding customer acquisition and retention. It also helps us identify areas where we can improve our product. Helps identify cohorts and the lifetime value of particular cohorts. Helps us understand what individual customers are having trouble with our system so we can give proactive customer support. Helps us identify issues with the onboarding experience. It's well suited for SaaS companies but may not be good for a general blog. User Review: "KISSmetrics or No Metrics"
KISSmetrics allows us to identify what's going wrong by who. This information is valuable to every business. It's important for any web startup that is going to have data coming in to use a service like KISSmetrics. User Review: "Kissmetrics is the BOMB"
I run social media for myself using Leadpages and heard about KISSmetrics. I checked out their infographics and blog. They provide a wealth of information without having to hire an analyst. It's more advanced and in depth than just regular analytics. It's well suited if you have the desire to really see true metrics and not just landing page conversions but timing and other good demographics. Kissmetrics aims to help companies get, keep and grow more customers with its customer engagement automation. This solution includes behavioral analytics, segmentation and email campaign automation all in one place. The vendor says Kissmetrics helps companies deeply understand and uniquely engage each customer from prospect to advocate. Additionally, the vendor says their solution is built to help marketers and product teams increase conversions, engagement, and retention over the entire lifespan of a customer. What are Monthly Tracked People? Monthly Tracked People are unique visitors that engage in an Event on your website or with your product, that gets tracked by you in Kissmetrics. Monthly Tracked People can be anonymous or identified.